The Super Bowl game was enjoyable for many reasons. As a admitted Giants fan, one of the best reasons was that my team won. Another reason is the commercials are something to look forward to. 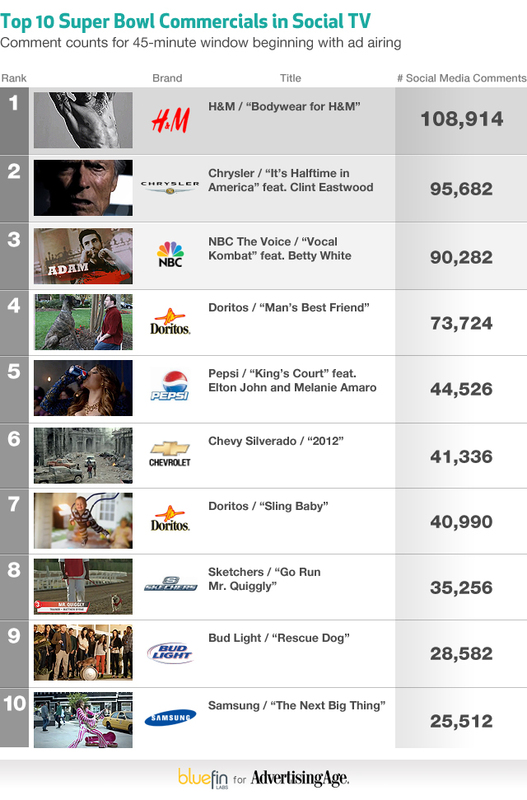 It is well known that the Super Bowl has a lot of viewers (100M+ for this year). To take advantage of this large captive audience, advertisers step up their game and showcase some of their best, riskiest and most creative commercials. Acura NSX Transactions with Jerry Seinfeld. What lengths some people go to for a car and to have the first one. Doritos Sling Baby – Shows that good guys win and easily overcome a bully. Score one for baby and GrandMa. Chevy Silverado 2012 – So this truck can survive anything, and apparently, so can Twinkies. What also surprised me was the direct mention (as a dis) of a major domestic competitor. Cars.com and the ‘neck’ – Get those keys and Go! Now that’s funny. Some much for being cool and rational when buying a car. I laughed the most at this one. We all have had that irrational, go-for-it inner voice at some point. M&M ‘Just My Shell’ – Oh, that kind of party. Once again shows what happens when you assume. Advertising Age has captured all the ads via this link. You can watch my favorites and yours after the jump. During the recent (and, tremendous) SuperBowl, there was a lot of social media activity. Here is a good post from my friend and fellow Giants fan (and, Jersey alum) that summarizes topics discussed online – a record number of tweets among them. Note – I was unplugged during the game also. Did you watch Super Bowl XLVI? As a fan of the New York Giants, I was certainly glued to the television until the very last play. The game set records not only for television viewership, but for social media activity as well. Being in the marketing industry, I’ve always paid close attention to the advertising during the game. As social media integration and proliferation continues to increase, it was interesting to see how it changed the advertising this year. The biggest change I noticed was how many of the ads were “leaked” in advance. This helped generate buzz and social media conversations ahead of, during, and after the game. But, the big question is, did it work? The biggest game in the NFL season is set for this Sunday. Who’s ready for championship football? This Super Bowl (46 and counting) is a re-match between the two teams that played for the championship 4 years ago. In SB XLII (42), the surprise winner was the underdog New York Giants. The result of that game was an amazing upset of the previously un-beaten New England Patriots. I found a recent article from the New York Times that reflects on that game and talks about the difference between destiny and opportunity. The win by the Giants ended the Patriots bid to become only the 2nd team in football history to go unbeaten the entire season. That feat is still solely owned by the 1972 Miami Dolphins team. One of the best part of being a fan is seeing your team play for, and win, the championship game. As a lifelong Giants fan, I am naturally biased for the Giants to win on Sunday. This year, the Giants are once again the underdog, by 3 points. The team relishes their underdog role even though they beat the Patrios in the initial SuperBowl meeting four years ago. They also came from behind to beat the Patriots in the regular season this year. As professionals, they realize those games are in the past and they are focused on Sunday. The hype media machine has been running for the last two weeks. Traditional media has provided the back story from every angle imaginable for the game. Social Media enables fans and non-fans to review and add to the hype. The hype will continue leading up to, and, during the game. The hype continues next week with post-game analysis from pundits and fans as well. I hope they talk about destiny and opportunity again. And, how the Giants fulfilled theirs and took advantage of the opportunity they earned and found a way to overcome adversity and beat the Patriots again. To answer my own question, Yes, I am ready for the game. I expect the Giants are ready also.